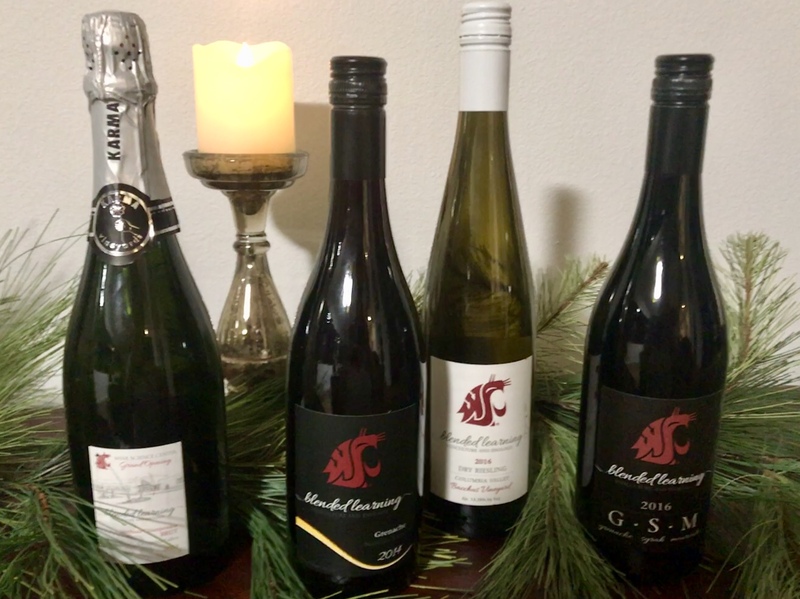 Toast the holidays with 30% off WSU Blended Learning wines through Friday, December 14th! 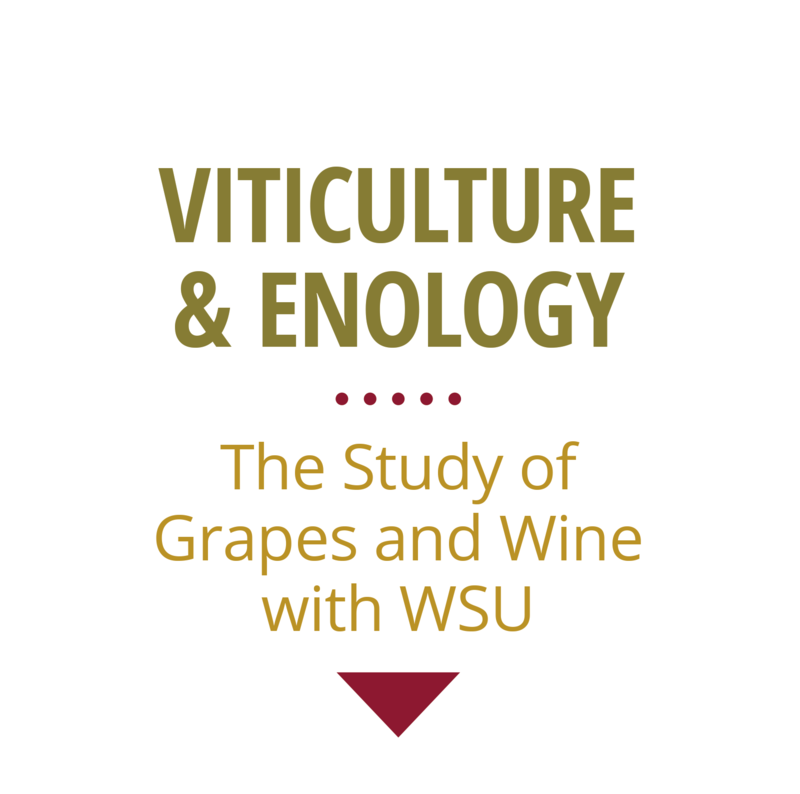 All WSU Blended Learning wines are student-made, under the direction of V&E faculty and in collaboration with grape growing and winemaking partners from the Washington wine industry. This wine was made in partnership with Winemaker Charlie Hoppes from Wine Boss and Fidelitas wineries in Richland, Wash. 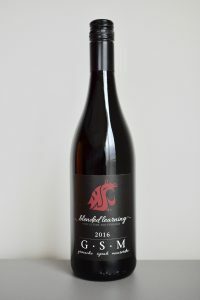 The fruit was donated by Boushey Vineyards which are located on the south slope of the Rattlesnake Hills, north of Grandview, Wash.This wine was barrel-fermented without malolactic fermentation. 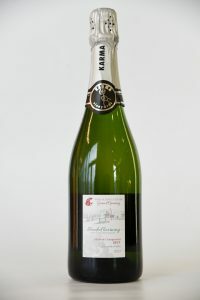 Extended aging on the yeast lees helped the wine develop ripe passion fruit and citrus flavors. 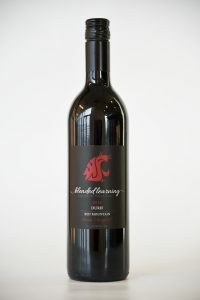 WSU V&E Director Dr. Thomas Henick-Kling and WSU research winemaker Richard Larsen collaborated with students to create this truly unique wine. 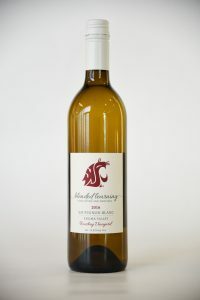 It is the first commercial wine ever produced in the WSU Winery at the Ste. Michelle Wine Estates WSU Wine Science Center in Richland, Wash. The fruit was donated by Sagemoor Vineyards and was sourced from their Bacchus Vineyard. Bacchus vineyard is located just east of the Columbia River about 15 miles north of the Tri-Cities and is home to multiple varieties planted on 180 acres. 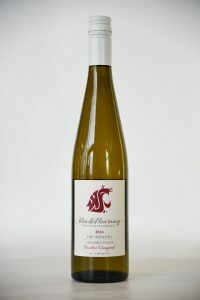 The vineyard is managed by WSU alum Lacey Lybeck.This single-clone Riesling was made from clone #198, a clone with characteristically strong mineral and floral flavors and a fine texture. Single-clone Rieslings are uncommon in the state of Washington. The wine was fermented with a select Riesling yeast in 100% stainless steel. Aging was extended on yeast lees (5 months) to build body and enhance fruit aromas. The wine has a fine texture and a clean, crisp finish. 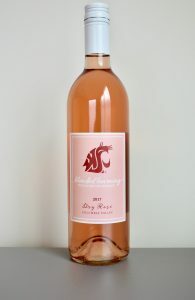 This student winemaking project originated from a technical collaboration between WSU Associate Professor, Dr. Jim Harbertson and Winemaker Katie Nelson whose research aimed to better understand and manage color in Rosé wine. Utilizing their research results and winemaking expertise, Katie and Dr. Harbertson led students through a blending exercise using a unique selection of single cultivar Rosés. Each of the sample wines were fermented with grapes grown specifically for Rosé production­, wherein grapes were picked early to maximize acidity, lighter color and lower alcohol–characteristics of modern-day Rosé.During the exercise, students were given a few constraints with the ultimate goal of creating the best quality Rosé from the sample wines provided. 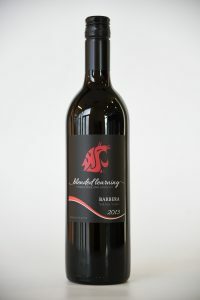 With fine acidity and intense fruit flavors, this unique blend resulted in a well-balanced, relaxed wine with a creamy finish. This easy-drinking wine can appeal to casual wine drinkers who will enjoy the bold red fruit flavor, and more demanding wine lovers who desire it’s dry palate. This wine was made in partnership with winemaker Charlie Hoppes, from Wine Boss and Fidelitas wineries. The fruit was donated by Lonesome Spring Ranch on the Rattlesnake Mountain bench near Benton City, Wash. The fruit was hand sorted, destemmed and fermented in stainless steel. The wine underwent a brief barrel aging of seven months creating this finely textured wine with a strong fruit middle, and a mildly spicy, oak finish. The Blended Learning class of 2013 set out to explore the influence of training systems on grapes and wine. They worked with Hedges Family Estates on Red Mountain whose estate vineyards contained the same clone of Syrah, grown side-by-side, using Head-trained and Loose VSP training systems. The Loose VSP (vertical shoot position) system is the predominant trellising system in Washington State and in much of the world. In this system, there can be one cordon or two cordon arms with shoots trained and held in place by catch wires. This system creates narrow vertical canopies with well exposed fruit. Head-trained vines are free-standing and grow without the support of a trellis. The vines have a short trunk and the shoots originate from the crown of spurs and are allowed to fall in a circular manner.Upon harvest, the students quickly began noticing subtle differences in the fruit flavors. The grapes were fermented using the same fermenters and processes. 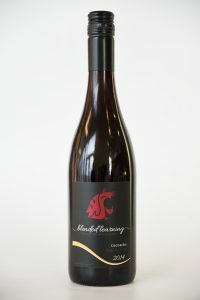 After fermentation, the wines were very distinctive, prompting students to bottle them individually, creating a unique tasting experience for the consumer. This small lot production was made in partnership with Winemaker Charlie Hoppes, from Wine Boss and Fidelitas wineries. The fruit was donated by Milbrandt Vineyards and sourced from their Clifton Bluffs Vineyard.The wine was fermented at moderate temperatures and pressed using a basket press for gentle extraction. Malolactic fermentation was finished in a combination of new and used French oak followed by a short barrel aging to retain vibrant spice and fruit aromas and add supple oak tannins. To integrate tannins with strong fruit aromas of strawberry, blueberry, spice and toasted coconut, the wine was further aged in the bottle for one year. This resulted in a finely textured wine with strong pepper and fruit aromas with a long, gentle finish. Durif is a grape variety that originated in France in the 1880’s. Named after its creator, botanist Francois Durif, it is a cross between Syrah and Peloursin. Originally praised for its small berry size and resistance to powdery mildew, it was planted in various regions of France. Today, Durif is only found in one appellation in France and can also be found in Australia, California and Israel. Once the cultivar was establish in the U.S. it became known as Petite Sirah.Durif (Petite Sirah) is known for its high acidity, bold tannin and deep purple, inky color. These characteristics are very apparent in this wine which was harvested late in the season to capitalize on the rich fruit flavors. In production, the free-run wine and the pressed wine were separated, individually barrel-aged and blended back in 50:50 proportion to create a robust, full-bodied mouthfeel with attractive fruit aromas. This powerful wine will stand up nicely to a richer, fatty food. Pair with rich, meaty dishes, exotic spice dishes like curries, and dry, strong cheeses. This richly textured wine encapsulates the ripe fruit flavors and well-developed tannins associated with Elephant Mountain grapes. Elephant Mountain produces some of Washington’s most respected Syrah because of its high elevation and warm temperatures, which allow the grapes to ripen with nice acidity and fine tannins. Andrew Schultz, vineyard manager from Hattrup Farms Inc. and a WSU V&E alum, worked with V&E students to select the fruit and make the harvest decisions. Syrah was harvested in early September, followed by the Grenache and Mourvèdre which were harvested a month later.Caleb Foster from Bookwalter winery and the students decided to co-ferment the Grenache and Mourvèdre and opted to use 2-3 year-old oak barrels to support the red fruit and earthy flavors and refined tannins that naturally occurred in the wine. The wines were barrel-aged for 10 months, blended and bottle-aged for an additional 8+ months. Partner Vineyard: Hattrup Farms Inc.